After a full day of work, errands, social engagements, kids, or whatever fills up your day, it’s not always easy to wind down. If only it could be as easy as flipping a switch. Actually, it’s almost that easy with soothing and relaxing aromatherapy oils from NOW Solutions. 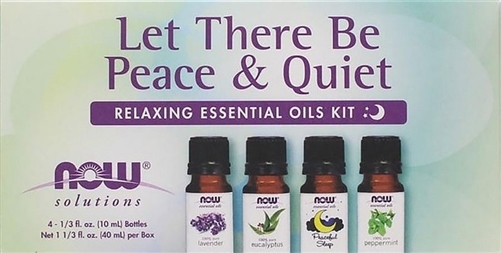 With just a few drops of the calming aromas found in Let There Be Peace & Quiet you can promote peace and tranquility whenever and wherever they’re needed most. Add to a diffuser, add 4 to 5 drops to a hot bath before bed, or create a room mister by adding 30 drops to 1 oz of water in a spray bottle. Use caution when adding essential oils to a bath tub since they can make surfaces slippery. Natural essential oils are highly concentrated and should be used with care.